Recently I’ve been working on developing some extensions for Visual Studio Team Services (VSTS). Being able to develop custom extensions is great, since it enables you to extend the service with features that fulfil your needs. In order to use your extension inside VSTS, you have to go through all these steps. When you’re still developing and debugging your code, this makes for a very painful process. There is a neat little trick that you can use to overcome this, which makes debugging a VSTS extension much easier. It is described somewhere in the documentation, but it’s very well hidden so I thought I’d write a blog post about it. In order for your extension to load in VSTS, VSTS has to know some things about it, like: where to load your extension (e.g. as a dashboard widget or hub group), which html page to load and which permissions are required. These things are configured in your extension manifest. This manifest is used when packaging and publishing your extension to the marketplace. From there, it can be installed in your VSTS account. When I’m developing an extension, I’m using Visual Studio. Of course I want to be able to use all of Visual Studio’s debugging power and do quick iterations (write code, hit F5, check if it works). In order to make this work we’ll trick VSTS to load our extension html from our local machine. Of course this won’t work for production scenario’s, but for debugging it’s fantastic. id: the id has to be unique across all your extensions. I usually prepend “dev” for my development versions. baseUri: this is where the magic happens. 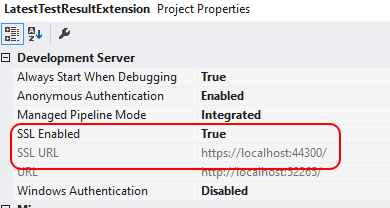 This tells VSTS to load the extension from your localhost, where you have your development version running in IISExpress from Visual Studio. Upload the resulting .vsix file to the marketplace and share & install it in your account. 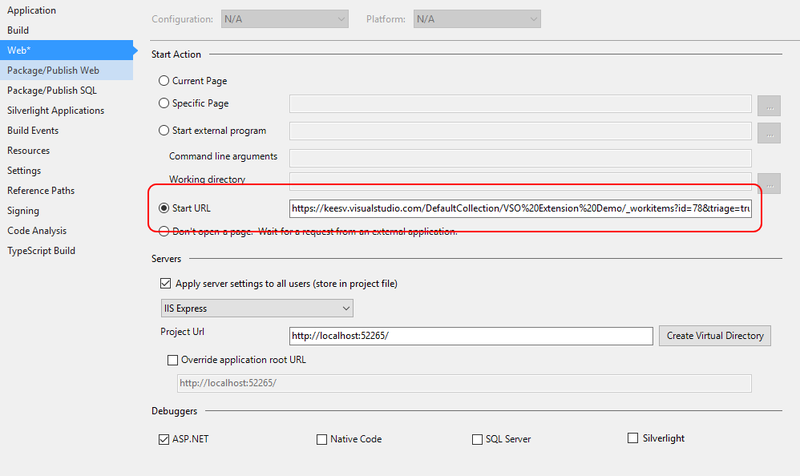 For instructions on how to do this, you can refer to the Visual Studio site. This will make sure that the debugger is attached to the correct browser process. Now hit F5 and you’ll be able to use the full power of the Visual Studio debugger! Many thanks for posting this! Just starting out on my VSTS extension adventure and this is going to make my life a lot easier :).